Happy Chinese New Year!…Still! only another 14 days of celebrating to go! 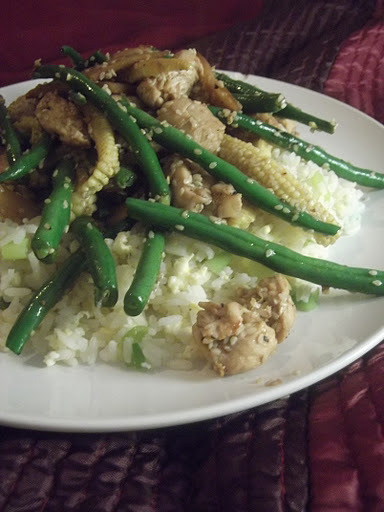 I’m afraid this will be the last Chinese themed post from me in a while so I’m sharing one of my favourites Sesame Chicken and Green Beans with Egg Fried Rice. Cook your rice according to the packets instructions adding the peas and sweetcorn to the water in the last 8 minutes of cooking time. Drain the rice thoroughly, patting with kitchen roll to remove as much moisture as possible and place to one side. Heat the oil in the pan and fry off the spring onion for a minute or two. Add a whisked egg mixed with a splash of soy sauce. Let the egg cook before adding the rice into the wok an stir frying for a few minutes until piping hot. In a wok heat the sesame oil until very hot. Add the chicken, garlic and chilli flakes and cook until the chicken is golden. Once the chicken has cooked, liberally add salt and pepper. Next add half of the soy sauce and sesame seeds for 2 minutes. Ad the vegetables (cut into long strips) and cook for a final 2 -3 minutes. Finally add the remaining soy sauce and rice vinegar. Give a quick toss of the wok and serve. You may be thinking that french green beans are as far from authentic Chinese cuisine as you can get – so, if you have an oriental food store near you, see if you can get your hands on some snake beans (very similar to the green bean just much longer) and chuck them in instead! 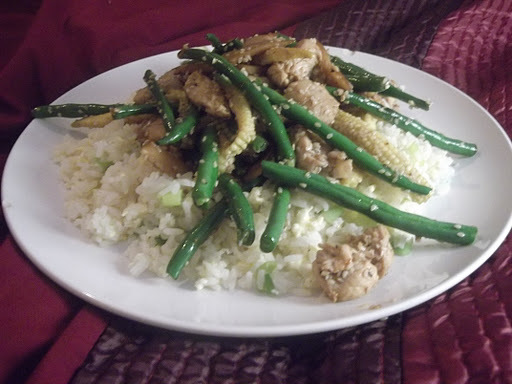 For the rest of you, trust me, green beans do just fine!